Does anyone have hint for this problem? 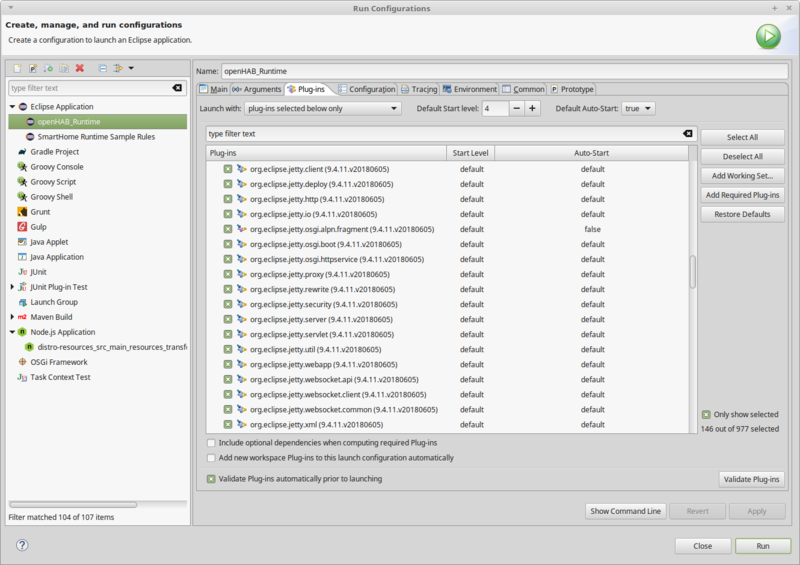 Please note that the latest supported eclipse IDE to use is Photon: https://www.eclipse.org/smarthome/documentation/development/ide.html Newer versions have among others problem with using the configured formatting of java. Unfortunately the openHAB documentation lacks somewhat behind in this area. 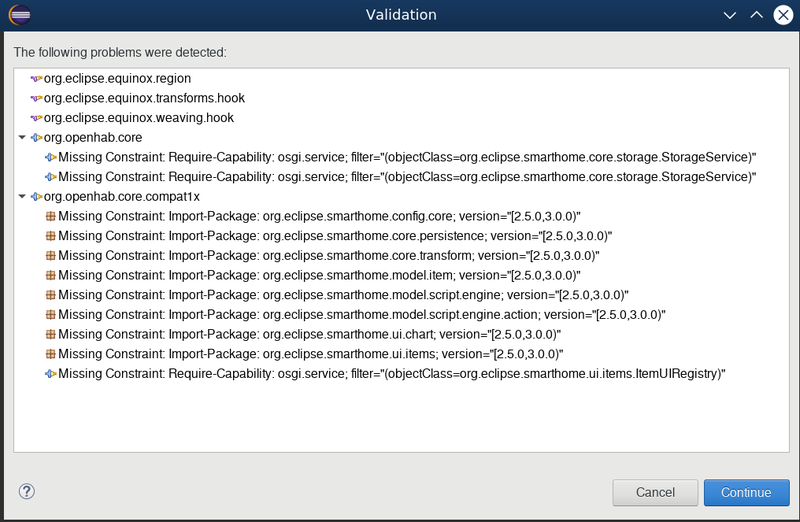 I removed everything (.m2 and .p2 inclusive) and did a fresh install with eclipse photon: same problem as before! Again, some jetty-libs of version 9.4.5 are installed besides 9.3.15 and are reference in the openHAB_Runtime - launch config and and it’s only possible to start it after un-checking the 9.4.5 ones. org.eclipse.jetty.rewrite_9.3.15.jar was not installed, but ther is a org.eclipse.jetty.rewrite_9.4.11.v20180605.jar which does not match. I installed the Eclipse IDE with all of its openhab2 projects and the eclipe smart home runtime. Then after running all setup tasks I was expecting to fire up the launch of the system and see the result in the browser by calling http://localhost:8080. Unfortunately I got this stacktrace (see below). I am running a Windows 10 System, my jdk is 1.8.201. Thanks in advance for any help. By the way: why are there so many errors and warnings in the openhab2 code? > !SESSION SLF4J: Failed to load class "org.slf4j.impl.StaticLoggerBinder". 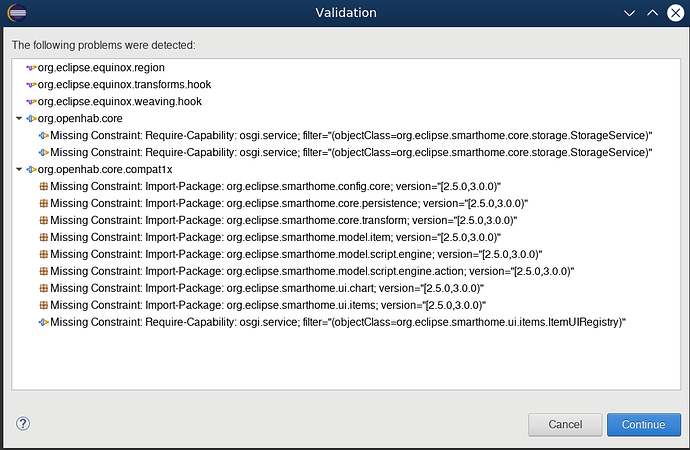 Unresolved requirement: Import-Package: org.eclipse.jetty.annotations; version="[9.3.0,10.0.0)"; resolution:="optional"
Unresolved requirement: Import-Package: org.eclipse.jetty.deploy; version="[9.3.0,10.0.0)"
-> Export-Package: org.eclipse.jetty.deploy; bundle-symbolic-name="org.eclipse.jetty.deploy"; bundle-version="9.3.15.v20161220"; version="9.3.15"; uses:="org.eclipse.jetty.deploy.graph,org.eclipse.jetty.server,org.eclipse.jetty.server.handler,org.eclipse.jetty.util,org.eclipse.jetty.util.annotation,org.eclipse.jetty.util.component"
Unresolved requirement: Import-Package: org.eclipse.jetty.jmx; version="[9.3.15,9.3.16)"; resolution:="optional"
Unresolved requirement: Import-Package: org.eclipse.jetty.server; version="[9.3.15,9.3.16)"
Unresolved requirement: Import-Package: org.eclipse.jetty.deploy.bindings; version="[9.3.0,10.0.0)"
-> Export-Package: org.eclipse.jetty.deploy.bindings; bundle-symbolic-name="org.eclipse.jetty.deploy"; bundle-version="9.3.15.v20161220"; version="9.3.15"; uses:="org.eclipse.jetty.deploy,org.eclipse.jetty.deploy.graph,org.eclipse.jetty.server"
This was exactly the same output I had after the clean installation: in the plugins-tab of the run configuration there was a mixture of different jetty libs activated which i cleared up to only have the 9.3.15 ones checked. Install eclipse with only openHAB Development selected. You can optionally select openAB 2 Add-ons. But when I work on a single binding I don’t do this. I just clone the openHAB2-addons in the git directory and import only what I need. This keeps it very clean and simple. You can of course also select openAB 2 Add-ons. This can be helpful to see how other bindings have implemented things. With the above mentioned options you should not have this problem. There is currently a big process on goging to move Eclipse Smart Home back in openHAB as you may have read. This will undeniable lead to some problems in the short term with regards to getting a development environment with the core working correctly. People are working hard to get this up-to-speed. If you are interested in the core and want to know more about it follow the openhab-core project. due to your advice I was able to create a distro without that much errors. Anyway there is a problem related to Jetty, please see my stacktrace. Any help is appreciated! !SESSION 2019-01-22 09:14:55.942 ------------SLF4J: Failed to load class “org.slf4j.impl.StaticLoggerBinder”. Unresolved requirement: Import-Package: org.eclipse.jetty.http; version="[9.3.15,9.3.16)"
Unresolved requirement: Import-Package: org.eclipse.jetty.servlet; version="[9.1.0,10.0.0)"
Unresolved requirement: Import-Package: org.eclipse.jetty.security; version="[9.4.5,9.4.6)"
Unresolved requirement: Import-Package: org.eclipse.jetty.client.api; version="[9.3.15,9.3.16)"
Unresolved requirement: Import-Package: org.eclipse.jetty.client; version="[9.3.15,9.3.16)"
Unresolved requirement: Import-Package: org.eclipse.jetty.io; version="[9.3.15,9.3.16)"
Unresolved requirement: Import-Package: org.eclipse.jetty.util; version="[9.3.15,9.3.16)"
Unresolved requirement: Import-Package: org.eclipse.jetty.client.api; version="[9.3.14,10.0.0)"
Unresolved requirement: Import-Package: org.eclipse.jetty.client; version="[9.3.14,10.0.0)"
!MESSAGE Bundle initial@reference:file:plugins/org.eclipse.jetty.client_9.3.15.v20161220.jar was not resolved. !MESSAGE Bundle initial@reference:file:plugins/org.eclipse.jetty.deploy_9.3.15.v20161220.jar was not resolved. !MESSAGE Bundle initial@reference:file:plugins/org.eclipse.jetty.osgi.boot_9.3.15.v20161220.jar was not resolved. !MESSAGE Bundle initial@reference:file:plugins/org.eclipse.jetty.osgi.httpservice_9.3.15.v20161220.jar was not resolved. !MESSAGE Bundle initial@reference:file:plugins/org.eclipse.jetty.proxy_9.3.15.v20161220.jar was not resolved. !MESSAGE Bundle initial@reference:file:plugins/org.eclipse.jetty.security_9.3.15.v20161220.jar was not resolved. !MESSAGE Bundle initial@reference:file:plugins/org.eclipse.jetty.servlet_9.4.5.v20170502.jar was not resolved. !MESSAGE Bundle initial@reference:file:plugins/org.eclipse.jetty.webapp_9.3.15.v20161220.jar was not resolved. !MESSAGE Bundle initial@reference:file:plugins/org.eclipse.jetty.websocket.client_9.3.15.v20161220.jar was not resolved. !MESSAGE Bundle initial@reference:file:plugins/org.eclipse.jetty.websocket.common_9.3.15.v20161220.jar was not resolved. !MESSAGE Bundle initial@reference:file:plugins/org.eclipse.jetty.xml_9.3.15.v20161220.jar was not resolved. !MESSAGE Bundle initial@reference:file:plugins/org.jupnp_2.5.1.jar was not resolved. Hi, I see that you are using another jetty-version, then I do. Hope that it might be for some help for you to figure out the reason for your problems. The entire file, I have to delete the < for each row, Hm? You need to use Photon. That is the latest supported version for now. Thanks a lot, I have thought somehow that I had installed Photon. I will let you know if there are any differences, regarding to the 2018-09 version, I have had this one running for about a month, there are problems but others than described in this thread. Reinstalled, and the installed version is like: Version: Photon Release (4.8.0). But this is so far the only differences I have found. Same .jetty. as before. I did a clean install according to Hilbrands recommendation and was able to run and debug openHAB - thanks very much for the tip! In the launch config -> plugins-Tab there are jetty-plugins of version 9.4.11 checked: in the original smarthome.target there are plugins of version 9.3.15 specified and downloaded - so why and according to which mechanism are these updated to v9.4.11 (the jetty.rewrite jar was only downloaded as v9.3.15…)? i try clean install current Eclipse version but installation stopped with errors in dependencies. I have downloaded the Photon Version of Eclipse but this is not installer. How i can add OpenHAB to Photon? This is simple clone from github to folder and set it is workspace or not? Or i can do this automaticaly from eclipse menu Help- Install New Software. I need only org.openhab.binding.zigbee repo to compile it in jar. Follow the directions I mentioned in the first answer in this topic. Use the eclipse installer. The page I mentioned describes how to get openHAB into eclipse. I have installed Eclipse by using the installer and enabled Eclipse Smart Home Runtime, openHAB Development and openHAB2-Addons. The system were built and I was able to start openHAB-Demo on localhost:8080! Thanks for fixing this, now I can accelerate my work on the current binding! Cheers. !SESSION SLF4J: Failed to load class “org.slf4j.impl.StaticLoggerBinder”. ** Unresolved requirement: Import-Package: org.eclipse.jetty.http; version="[9.3.15,9.3.16)"
I have the same problem. Is there any solution, yet? Unresolved requirement: Import-Package: org.eclipse.jetty.annotations; version="[9.4.11,10.0.0)"; resolution:="optional"
Unresolved requirement: Import-Package: org.eclipse.jetty.deploy.bindings; version="[9.4.11,10.0.0)"
-> Export-Package: org.eclipse.jetty.deploy.bindings; bundle-symbolic-name="org.eclipse.jetty.deploy"; bundle-version="9.4.11.v20180605"; version="9.4.11"; uses:="org.eclipse.jetty.deploy,org.eclipse.jetty.deploy.graph,org.eclipse.jetty.server"
Unresolved requirement: Import-Package: org.eclipse.jetty.jmx; version="[9.4.11,10.0.0)"; resolution:="optional"
Unresolved requirement: Import-Package: org.eclipse.jetty.server; version="[9.4.11,10.0.0)"
Unresolved requirement: Import-Package: org.eclipse.jetty.deploy; version="[9.4.11,10.0.0)"
-> Export-Package: org.eclipse.jetty.deploy; bundle-symbolic-name="org.eclipse.jetty.deploy"; bundle-version="9.4.11.v20180605"; version="9.4.11"; uses:="org.eclipse.jetty.deploy.graph,org.eclipse.jetty.server,org.eclipse.jetty.server.handler,org.eclipse.jetty.util,org.eclipse.jetty.util.annotation,org.eclipse.jetty.util.component,org.eclipse.jetty.util.resource,org.eclipse.jetty.xml"
Unresolved requirement: Import-Package: org.eclipse.jetty.io; version="[9.4.11,10.0.0)"
Unresolved requirement: Import-Package: org.eclipse.jetty.http; version="[9.4.11,10.0.0)"
-> Export-Package: org.eclipse.jetty.http; bundle-symbolic-name="org.eclipse.jetty.http"; bundle-version="9.4.11.v20180605"; version="9.4.11"; uses:="javax.servlet,javax.servlet.http,org.eclipse.jetty.io,org.eclipse.jetty.util,org.eclipse.jetty.util.component,org.eclipse.jetty.util.log,org.eclipse.jetty.util.resource"
-> Export-Package: org.eclipse.jetty.servlet; bundle-symbolic-name="org.eclipse.jetty.servlet"; bundle-version="9.4.5.v20170502"; version="9.4.5"; uses:="javax.servlet,javax.servlet.descriptor,javax.servlet.http,org.eclipse.jetty.http.pathmap,org.eclipse.jetty.security,org.eclipse.jetty.server,org.eclipse.jetty.server.handler,org.eclipse.jetty.server.handler.gzip,org.eclipse.jetty.server.session,org.eclipse.jetty.util,org.eclipse.jetty.util.annotation,org.eclipse.jetty.util.component,org.eclipse.jetty.util.resource"
Unresolved requirement: Import-Package: org.eclipse.jetty.http; version="[9.4.5,9.4.6)"
Unresolved requirement: Import-Package: org.eclipse.jetty.client.api; version="[9.4.11,10.0.0)"
-> Export-Package: org.eclipse.jetty.client.api; bundle-symbolic-name="org.eclipse.jetty.client"; bundle-version="9.4.11.v20180605"; version="9.4.11"; uses:="org.eclipse.jetty.http,org.eclipse.jetty.util"
Unresolved requirement: Import-Package: org.eclipse.jetty.client; version="[9.4.11,10.0.0)"
-> Export-Package: org.eclipse.jetty.client; bundle-symbolic-name="org.eclipse.jetty.client"; bundle-version="9.4.11.v20180605"; version="9.4.11"; uses:="org.eclipse.jetty.client.api,org.eclipse.jetty.client.util,org.eclipse.jetty.http,org.eclipse.jetty.io,org.eclipse.jetty.util,org.eclipse.jetty.util.annotation,org.eclipse.jetty.util.component,org.eclipse.jetty.util.log,org.eclipse.jetty.util.ssl,org.eclipse.jetty.util.thread"
Unresolved requirement: Import-Package: org.eclipse.jetty.http.pathmap; version="[9.4.11,10.0.0)"
-> Export-Package: org.eclipse.jetty.http.pathmap; bundle-symbolic-name="org.eclipse.jetty.http"; bundle-version="9.4.11.v20180605"; version="9.4.11"; uses:="org.eclipse.jetty.util.annotation,org.eclipse.jetty.util.component"
Unresolved requirement: Import-Package: org.eclipse.jetty.util; version="[9.4.11,10.0.0)"
Unresolved requirement: Import-Package: org.eclipse.smarthome.config.core; version="[2.5.0,3.0.0)"
2019-02-10 19:05:35.792 [DEBUG] [.e.s.c.i.i18n.I18nProviderImpl:180  ] - No language set, setting locale to 'null'. 2019-02-10 19:05:35.792 [DEBUG] [.e.s.c.i.i18n.I18nProviderImpl:162  ] - Error setting measurement system for value 'null'. !MESSAGE Bundle initial@reference:file:plugins/org.eclipse.jetty.client_9.4.11.v20180605.jar was not resolved. !MESSAGE Bundle initial@reference:file:plugins/org.eclipse.jetty.deploy_9.4.11.v20180605.jar was not resolved. !MESSAGE Bundle initial@reference:file:plugins/org.eclipse.jetty.http_9.4.11.v20180605.jar was not resolved. !MESSAGE Bundle initial@reference:file:plugins/org.eclipse.jetty.osgi.boot_9.4.11.v20180605.jar was not resolved. !MESSAGE Bundle initial@reference:file:plugins/org.eclipse.jetty.osgi.httpservice_9.4.11.v20180605.jar was not resolved. !MESSAGE Bundle initial@reference:file:plugins/org.eclipse.jetty.proxy_9.4.11.v20180605.jar was not resolved. !MESSAGE Bundle initial@reference:file:plugins/org.eclipse.jetty.rewrite_9.4.11.v20180605.jar was not resolved. !MESSAGE Bundle initial@reference:file:plugins/org.eclipse.jetty.security_9.4.11.v20180605.jar was not resolved. !MESSAGE Bundle initial@reference:file:plugins/org.eclipse.jetty.server_9.4.5.v20170502.jar was not resolved. !MESSAGE Bundle initial@reference:file:plugins/org.eclipse.jetty.webapp_9.4.11.v20180605.jar was not resolved. !MESSAGE Bundle initial@reference:file:plugins/org.eclipse.jetty.websocket.client_9.4.11.v20180605.jar was not resolved. !MESSAGE Bundle initial@reference:file:plugins/org.eclipse.jetty.websocket.common_9.4.11.v20180605.jar was not resolved. !MESSAGE Bundle initial@reference:file:plugins/org.eclipse.jetty.xml_9.4.11.v20180605.jar was not resolved. !MESSAGE Bundle initial@reference:file:plugins/org.openhab.core.compat1x_2.5.0.20190201163017.jar was not resolved. I’m also unclear on how to modify/test anything in openhab-core. Previously, there was a Runtime package with ESH in it. @hillbrand, you’ve been helpful with this. Do you have any insights, or do we just need to wait it out? I have a number of automation changes that I need to debug!